Egypt and the Classical World Exhibit at the Getty Museum – Zero Equals Two! “In a major exhibition, the J. Paul Getty Museum will examine the cultural and artistic connections between Greece, Rome, and the most ancient of the Mediterranean civilizations, Egypt. On view at the Getty Center from March 27, 2018 through September 9, 2018, Beyond the Nile: Egypt and the Classical World will include nearly 200 rare objects, many of them on view in the U.S. for the first time. “Exploring the artistic interplay between these cultures from the Bronze Age to Roman times (2000 BC–AD 300), the exhibition includes nearly 200 objects, including royal Egyptian stone vessels sent to Minoan Crete and Mycenaean Greece, Archaic Greek pottery and sculpture inspired by Egyptian models, superb portraits in Egyptian and Greek style created during Greek rule in Egypt, and remarkable religious images and luxury goods with Egyptian themes made for Roman patrons in Italy. “Beginning in about 2000 BC when Egyptians developed trade contacts with Crete and mainland Greece, and continuing through to the 4th century AD Roman Empire, the exhibition explore the multiple ways in which Egypt and the classical world of Greece and Rome interacted, each selectively borrowing from and influencing the other, and at times through conquest and occupation. 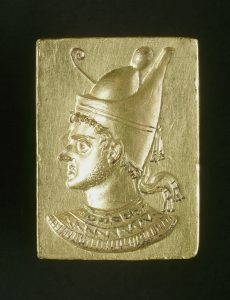 The exhibition is divided into four major historical phases: The Middle and Late Bronze Ages (ca. 2000-1100 BC), The Archaic and Classical Periods (ca. 700-332 BC), the Hellenistic period (332-30 BC) and Egypt under Roman Rule (30 BC-4th century AD). “In the Bronze Age, Egypt traded with the Minoans of Crete and the Mycenaeans of mainland Greece, and the exhibition will highlight diplomatic gifts and trade goods from this era. From the Archaic and Classical periods, the presence of Greeks in Egypt as mercenaries and traders is attested through various trends. Small Egyptian objects were imported to Greece and copied locally. Greek sculptors of the 7th and 6th centuries BC were inspired to carve their first large stone figures after seeing the millennia-old tradition of monumental sculpture in Egypt. Myths with Egypt themes were depicted on Greek vases. “After Alexander’s conquest of Egypt in 332 BC, Egypt came under control of a Greek dynasty – the Ptolemies – that would rule the land for nearly 300 years. The exhibition will explore the complex hybrid culture that existed in Egypt under Ptolemaic kings and queens, especially developments in private and royal portraiture, including portraits of Cleopatra, Julius Caesar, and Marc Antony. “With the death of Cleopatra VII in 30 BC, Egypt became a Roman province. The exhibition explores in depth the connection between art and identity in Roman Egypt, as well as the Roman fashion for Egyptian imagery, and the spread of Egyptian cults throughout the Roman Empire. This section of the exhibition will include stone sculptures that were exported in antiquity from Egypt to Italy, and Egyptian-influenced art made in Italy, including sculpture, frescoes, and luxury items decorated with Egyptian deities and exotic views of the Nile. “As part of the exhibition, visitors to the Getty Center will be greeted by a towering granite obelisk in the Museum Entrance Hall. This obelisk, carved in 88-89 A.D and dedicated, according to its hieroglyphic inscription, to the goddess Isis and the emperor Domitian, stands at more than 15 feet tall. It comes to the Getty from the Museo del Sannio in Benevento, Italy, and, like many objects in the exhibition, is a Roman work inspired by Egyptian art. The Getty Museum has partnered with the Museo del Sannio and the Provincia di Benevento to conserve and study the work while it is in Los Angeles. “Beyond the Nile will be the first in a series of exhibitions at the Getty Museum under the theme of The Classical World in Context, that explore relationships between the Classical world and the surrounding civilizations of the Mediterranean and Near East.